Nastaran Foyouzi, MD, Wayne W. Grody, M.D., Ph.D.
Congenital bilateral absence of the vas deferens (CBAVD) is considered a genital form of cystic fibrosis (CF). It is generally identified during the evaluation of male infertility and is associated with a high incidence of mutated cystic fibrosis transmembrane conductance regulator (CFTR) alleles. Diagnosis of CBAVD will be determined in males with azoospermia and absence of vas deferens or the presence of CBAVD-causing CFTR pathogenic variants. Currently genetic diagnosis or risk prediction of CBAVD is established by either expanded CFTR mutation testing or by carrier screening of the 23 most prevalent CFTR mutations comprising the minimal population screening panel recommended by ASRM, ACOG and ACMG. However, this approach raises some serious concerns including low and limited detection rates depending on the patient’s ethnicity, and inability to detect rare or novel CFTR mutations associated with CBAVD. Widespread CF carrier screening involves only targeted CFTR mutation analysis, which is typically accomplished by allele-specific DNA probe hybridization or by scanning selected exons of the CFTR gene containing the pathogenic variants of interest by either Sanger sequencing or Next-Generation Sequencing (NGS). These approaches only detect 25% of the mutations in CBAVD males, because the existing CF screening panels were originally designed to detect the most common mutations associated with CF, and were largely derived from study of affected patients of Northern European and Caucasian decent. Additionally, current screening approaches do not interrogate tandem nucleotide repeats located in intron 8 of the CFTR gene unless the R117H mutation is detected. This underscores the need for a more optimal approach to CFTR mutation detection in men with obstructive azoospermia and their reproductive partners. To that end, we sought to address the value of whole CFTR gene sequencing in these individuals and discuss the possible etiologies for negative common CF mutation screening in these patients. Presence of rare or unknown CF mutations in CBAVD: More than 1,800 mutations in the CFTR gene have been identified in individuals with cystic fibrosis (CF Genetic Analysis Consortium http://www.genet.sickkids.on.ca/cftr/). The most common mutation is a 3-bp deletion (CTT) in exon 10 of the gene, leading to the deletion of a phenylalanine at amino acid position 508 (ΔF508) (3). As a result, the protein does not undergo the normal posttranslational modification needed for delivery to the cell membrane and is degraded in the Golgi apparatus (4). The majority of the other CFTR mutations are very rare with only four other mutations (G542X, N1303K, G551D and W1282X) having overall frequencies above 1% (5). It is important to note that the frequency of known CFTR mutations is different in affected CF patients compared to those with CBAVD; For example, the frequency of ΔF508 is 21% in CBAVD versus 76% in classic CF patients (6). These differences in frequency of the regularly tested mutations in CBAVD compared to classic CF render most CF screening panels less useful for infertility investigations. Presence of intronic repeats: The heterogeneous phenotype of CBAVD and inability to identify the 2 mutations in >80 % of individuals with CBAVD has been attributed to variability in the number of thymidine nucleotide repeats (polythymidine polymorphism annotated as 5T, 7T, 9T) and the presence of TG repeats in intron 8 of CFTR (1, 7). For example, when TG repeat number is determined, the sensitivity for identifying affected individuals is increased to 91%, while the specificity for excluding those who are unaffected is 78% (8). Currently, none of the CF carrier screening panels will routinely test for these microsatellite repeats unless the R117H mutation is identified, in which case it is performed as a reflex test. Given the possibility of less common or novel CFTR pathogenic variants other than R117H in CBAVD patients, omission of these repeat polymorphisms from the carrier screening report will affect the interpretation and underestimate the risk to offspring. It must be acknowledged that the testing guidelines for CF carrier screening were designed to inform couples of the risk of classical CF in their offspring, not CBAVD. However, diagnostic work-up of infertile males with CBAVD usually will include analysis of the polyT and polyTG repeats in intron 8, regardless of whether the R117H mutation is detected. Ethnic differences: The frequency of CFTR mutations is not equally distributed across populations with CBADV. For instance, the ΔF508 mutation is more common in Caucasian (22%) rather than non-Caucasian (8%) populations, and the 5T allele is more common in non-Caucasian (31%) versus Caucasian (20%) populations (9) (Table-1). 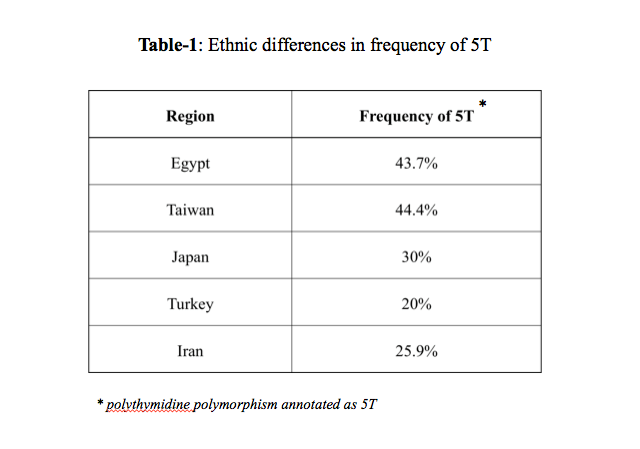 Additionally, the clinical sensitivity of current 23-mutation panel screening tests are not absolute for all ethnic groups and some mutations will not be detected: for example, CF carrier detection rates are estimated to be 97% for Ashkenazi Jewish, 88% for non-Hispanic Caucasian, 69% for African American, and 57% for Hispanic populations; the detection rate in Asian Americans is not precisely known but is undoubtedly much lower than in the other groups (10, 11) . Even a panel that includes more than 129 pathogenic variants would have a high yield 96% carrier detection rate only in individuals with Northern European ancestry (12). This is largely due to the dramatically lower proportion of carriers of ΔF508 in the other groups. Therefore, standard CFTR screening will tend to underscore CFTR mutation detection in men with obstructive azoospermia, especially among non-Caucasians. Presence of CF gene deletion: In 2% of patients with CBAVD, the mutation is a large deletion involving one or more CFTR exons (13), which will usually be invisible to standard sequence analysis, as the technique is inefficient at detecting large deletions and duplications. Hence, in CBAVD patients it is important to consider deletion/duplication analysis, either concurrent with CFTR gene sequencing or when sequencing is negative. Presence of modifier genes: Sometimes a mutation is not present in the CFTR gene but rather in other genes that are capable of modifying the phenotypic effect of CFTR mutations. For example, it is well established that transforming growth factor β (TGFβ-1) and endothelin receptor type A (ENDRA) are important modifiers of the CF pulmonary phenotype (14). Recently it has been shown that TGFβ-1 and EDNRA play a significant role in development of the vas deferens, and indicate that the defective gene products may contribute to development of CBAVD in the setting of CFTR insufficiency (15, 16). There is some evidence that other genes may cause CF-like disease in a small fraction of patients. These findings are too preliminary to be used routinely in a clinical context. Insufficient knowledge about CBAVD: The most studied genotype-phenotype correlation of CF is the classic form of the disease. It has been shown that the only symptom that correlates well with the mutational genotype in CFTR is pancreatic function. In CF patients from the same family, pancreatic function tends to “breed true”, indicating that exocrine pancreatic status is determined primarily by the genotype at the CFTR locus. However, pulmonary disease, liver disease and CBAVD do not show much correlation with the type of mutation and vary considerably within families, which represents the clinical heterogeneity of the disease. In summary, the distinction between CF and CBAVD requires a proper clinical examination of the patient, personal and family history, and a different approach to molecular testing. The most thorough approach is complete CFTR mutation analysis and genetic counseling of CBAVD males who are planning to undergo assisted reproductive technologies (ART). Keep in mind that detailed genetic analysis (such as sequencing) of the CFTR gene is considered a diagnostic test rather than a screening procedure, and the panels used in routine carrier screening cover only the most common classic CF pathogenic variants, leaving less frequent mutations missed. For this reason, it is important to offer whole CFTR gene analysis by either Sanger or NGS and including intronic poly T and poly TG tract analysis, along with consideration of geographical and ethnic differences, to all CBAVD males who are planning to undergo fertility treatment. Sequencing and deletion analysis of all exons, intron/exon borders, promoter regions and specific intronic regions of the CFTR gene detects more than 98% of CFTR mutations (17). The cost comparison and insurance coverage between CF carrier screening and full CFTR gene sequencing is another challenge for patients and clinicians. Current CF carrier testing costs about $100–$300 per person compared to $500-$1500 for full gene sequencing. Insurance coverage differs according to policy, and it will be helpful to inform the insurance companies about the role of full CFTR gene sequencing in CBAVD as a diagnostic rather than screening strategy, as we have described here. Only in this way will the molecular dissection of male infertility due to CBAVD be optimized and accurate risk assessment to offspring’s could be determined. 1. Cuppens H, Lin W, Jaspers M, Costes B, Teng H, Vankeerberghen A et al. Polyvariant mutant cystic fibrosis transmembrane conductance regulator genes. The polymorphic (Tg)m locus explains the partial penetrance of the T5 polymorphism as a disease mutation. J Clin Invest 1998;101:487-96. 2. Chillon M, Casals T, Mercier B, Bassas L, Lissens W, Silber S et al. Mutations in the cystic fibrosis gene in patients with congenital absence of the vas deferens. N Engl J Med 1995;332:1475-80. 3. Population variation of common cystic fibrosis mutations. The Cystic Fibrosis Genetic Analysis Consortium. Hum Mutat 1994;4:167-77. 4. Chu CS, Trapnell BC, Curristin S, Cutting GR, Crystal RG. Genetic basis of variable exon 9 skipping in cystic fibrosis transmembrane conductance regulator mRNA. Nat Genet 1993;3:151-6. 5. Rowntree RK, Harris A. The phenotypic consequences of CFTR mutations. Ann Hum Genet 2003;67:471-85. 6. Claustres M. Molecular pathology of the CFTR locus in male infertility. Reprod Biomed Online 2005;10:14-41. 7. Lebo RV, Grody WW. Variable penetrance and expressivity of the splice altering 5T sequence in the cystic fibrosis gene. Genet Test 2007;11:32-44. 8. Groman JD, Hefferon TW, Casals T, Bassas L, Estivill X, Des Georges M et al. Variation in a repeat sequence determines whether a common variant of the cystic fibrosis transmembrane conductance regulator gene is pathogenic or benign. Am J Hum Genet 2004;74:176-9. 9. Yu J, Chen Z, Ni Y, Li Z. CFTR mutations in men with congenital bilateral absence of the vas deferens (CBAVD): a systemic review and meta-analysis. Hum Reprod 2012;27:25-35. 10. Grody WW, Cutting GR, Klinger KW, Richards CS, Watson MS, Desnick RJ et al. Laboratory standards and guidelines for population-based cystic fibrosis carrier screening. Genet Med 2001;3:149-54. 11. Watson MS, Cutting GR, Desnick RJ, Driscoll DA, Klinger K, Mennuti M et al. Cystic fibrosis population carrier screening: 2004 revision of American College of Medical Genetics mutation panel. Genet Med 2004;6:387-91. 12. Sosnay PR, Siklosi KR, Van Goor F, Kaniecki K, Yu H, Sharma N et al. Defining the disease liability of variants in the cystic fibrosis transmembrane conductance regulator gene. Nat Genet 2013;45:1160-7. 13. Hantash FM, Milunsky A, Wang Z, Anderson B, Sun W, Anguiano A et al. A large deletion in the CFTR gene in CBAVD. Genet Med 2006;8:93-5. 14. Drumm ML, Konstan MW, Schluchter MD, Handler A, Pace R, Zou F et al. Genetic modifiers of lung disease in cystic fibrosis. N Engl J Med 2005;353:1443-53. 15. Havasi V, Rowe SM, Kolettis PN, Dayangac D, Sahin A, Grangeia A et al. Association of cystic fibrosis genetic modifiers with congenital bilateral absence of the vas deferens. Fertil Steril 2010;94:2122-7. 16. Sharma H, Mavuduru RS, Singh SK, Prasad R. Heterogeneous spectrum of mutations in CFTR gene from Indian patients with congenital absence of the vas deferens and their association with cystic fibrosis genetic modifiers. Mol Hum Reprod 2014;20:827-35. 17. Strom CM, Huang D, Chen C, Buller A, Peng M, Quan F et al. Extensive sequencing of the cystic fibrosis transmembrane regulator gene: assay validation and unexpected benefits of developing a comprehensive test. Genet Med 2003;5:9-14. This is a very helpful review of the diverse genetic alterations found in men with CBAVD. The cost difference between carrier screening and full gene sequencing seems significant. Is there a subset of patients in whom you think it would be highest value to use full gene sequencing as a first test? Also, what would the cost effectiveness be of doing carrier screening first in all patients and reserving full gene sequencing for only patients with negative carrier screens? Thank you for your comment. With regards to your question about the presence of subset of patients in whom full gene sequencing as a first test would have the highest value ? I believe due to the lack of comprehensive genetic studies in CBAVD patients and therefore lacking a genotype phenotype relationship we do not know how to select these subgroup . Therefore, we need more data to be able to make the genotype- phenotype correlation. About the cost benefit, I agree, there is a steep difference in cost between the carrier screening and whole CF gene sequencing however if the patient has a diagnosis of CABVD which is one of the CF phenotype, then CF testing become diagnostic not screening therefore, considered as a medical necessity by the insurance companies and they will cover the cost. For example Ambry genetics will do the whole CF NGS testing including sequencing the intron boundaries with addition of del/dup (test code 1007). The cost for non insured patients is $1000, however they have a financial assistance program that patient can apply and they will give a good discount to the patients, so almost always patient does not pay the $1000. They also do all of the insurance pre-authorization and dealing with the insurance companies. The only thing that you need to do is to send them the requisition and a letter of medical necessities, which they have a sample letter in their website to fill. I am sure there are other companies that may be do the same however in my research I found Ambry the most comprehensive and cost benefit between them. FYI- I do not have any conflict of interest with Ambry, between couple companies that I have talked for our institution, I found Ambry the best fit for us, however I did not ask from all the companies but feel free to do your own research. 2. The higher possibility that the insurance company decline the diagnostic test. They can argue if the patient had a CF phenotype why screening test have been sent and they always decline the more expensive test. Also it will be difficult to prove the medical necessity to the insurance companies at this point. At the end, just wanted to point it out that the cost of having an offspring with CF is not even comparable with the cost of testing, so this should always be considered in counseling the patient. I hope I could answer all of your questions and concerns, please fell free to contact if you have more questions or concerns.